You’re in the right place if you are interested in classic cars and would like to see some of the restored Pontiacs that Hubcaps.com has provided hub caps for! Our restoration crew is one of the most talented in this industry and we prove it daily by producing the best quality restoration work around. Whether you buy your wheelcovers from us or send your own in to be refurbished, you will be pleasantly shocked at the results! The Pontiac make itself was founded in 1926 as a division of General Motors and was discontinued just recently in 2010. Some of the most popular vintage cars are Pontiacs and we are happy to have had a chance to contribute to their unique beauty! 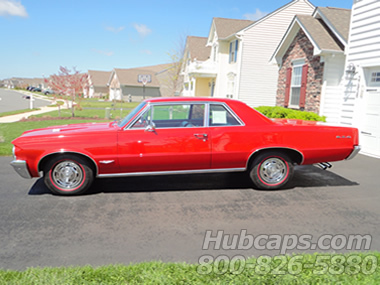 Please browse through our page dedicated to our customer’s gorgeous 1967 Pontiac Bonneville. Learn more about how this vehicle’s journey through two generations and its current home in Florida. Click here for more of this blue beauty!